Easter is right around the corner! Have you been so busy that you haven’t had a chance to even think about your Easter centerpiece? 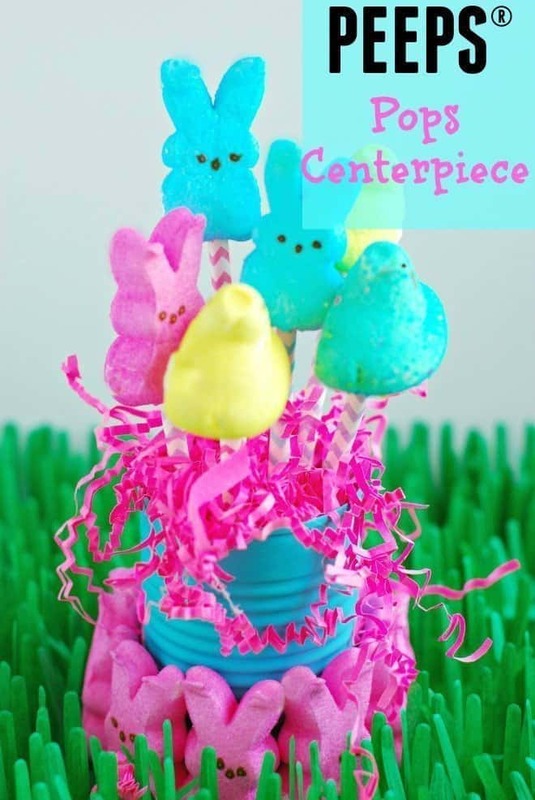 Here are a few of my favorite and Easy DIY Easter Centerpieces. One good thing about waiting until the last minute is that most of the Easter decor is probably on sale. The bad thing about waiting is that all the good stuff may be gone. I’ve rounded up a few of my easy Easter centerpieces that I’ve done in the past. I love decorating for Easter. Spring is in the air and it’s the perfect time to put up all the heavy winter decor and pull out light, pastel pieces. This is one of my favorite tablescapes. I’m using bowls that my mom left me and China from my aunt. Any time I can incorporate pieces that have been handed down through generations, I’m all in. The centerpiece is almost free! Gather some twigs. Spray paint them white and add pastel colored jelly beans with your hot glue gun. Place in a white or pastel colored vase. You’re done! 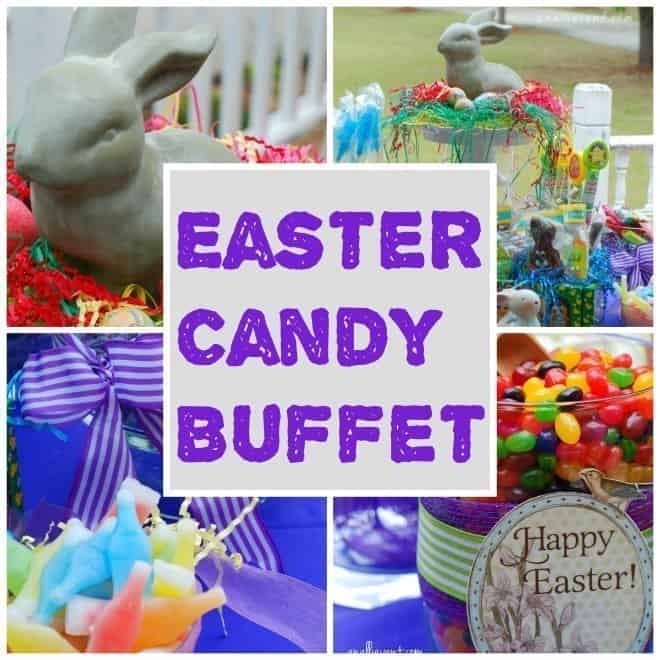 Another favorite centerpiece is one I put together for my Easter Candy Buffet. You will need a cake plate for the base. 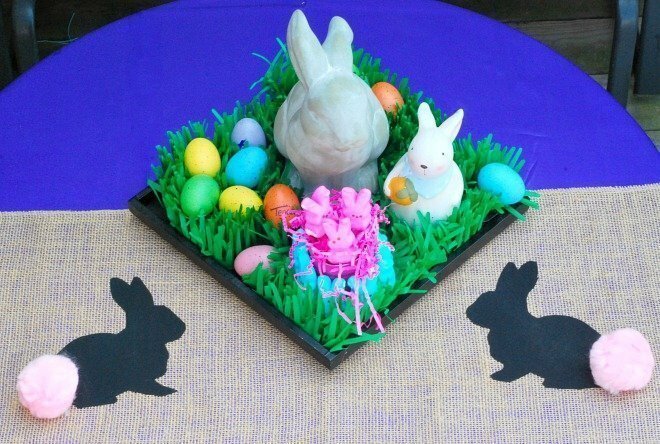 Place a bunny in the center of the cake plate, surround him with Easter grass (purchased at The Dollar Tree) and Easter Eggs. I “borrowed” the eggs from my Easter basket wreath. How about a PEEPS Pop Centerpiece? My son-in-law loves PEEPS. I had rather decorate with them than eat them. 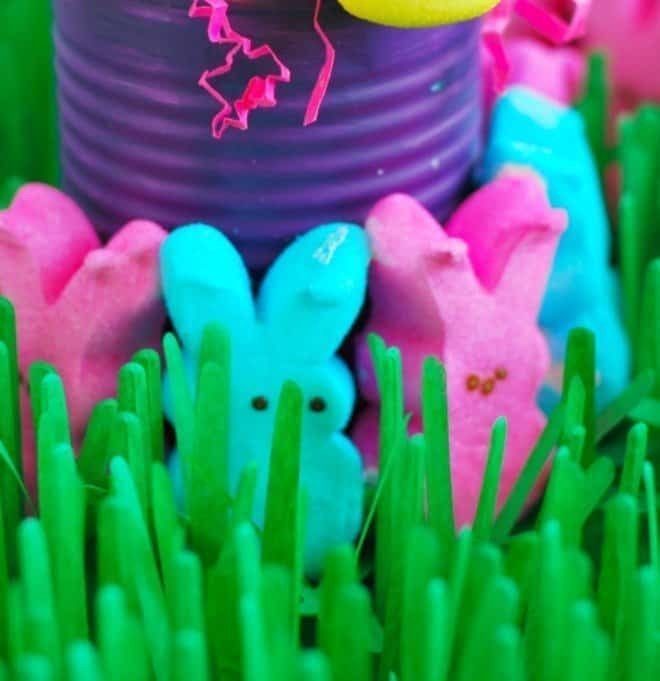 I painted some tin cans and added PEEPS to pastel-colored straws. The kids will love this one! 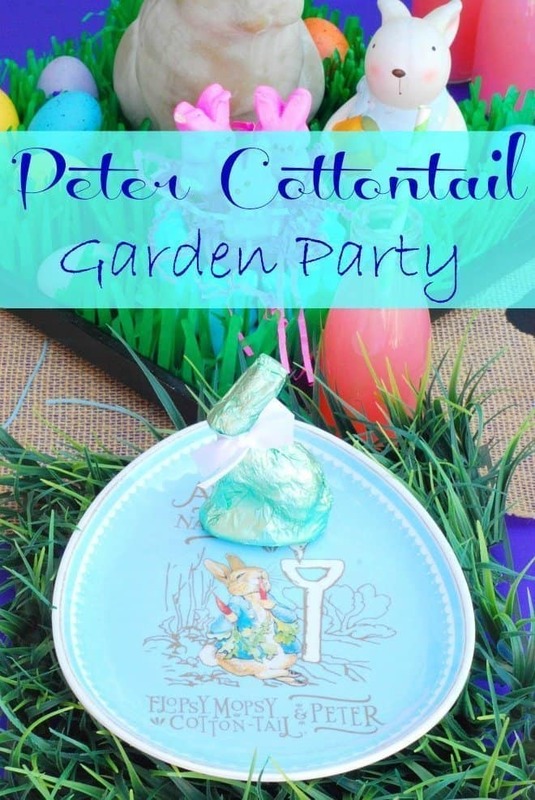 One of my favorite Easter tablescapes is Here Comes Peter Cottontail. I loved Peter Cottontail when I was a little girl and this one brings back so many memories. I found a silhouette of a bunny online. You just need to print it out, cut it out and trace it (twice) onto black felt. Use fusible web to add it to the burlap runner. I bought the pink poms at Hobby Lobby and hot-glued them to the rabbit’s behind. Looking back, I should have used smaller poms but the kids love it. You can use different size jars and add chocolate rabbits, candies or jelly beans. You have an instant centerpiece. Small jars with small chocolate bunnies or eggs make great place cards. Easter is one of my very favorite holidays. How do you decorate for Easter? These are all just really cute and good ideas for centerpieces. I did one with marble easter eggs my mother had for years. Too cute! I might have to do some of these. We’re having Easter with my parents, so maybe I can bring a centerpiece to their house. I’m now inspired to start decorating for Easter. I believe I could create a couple of these to create a cute centerpiece. 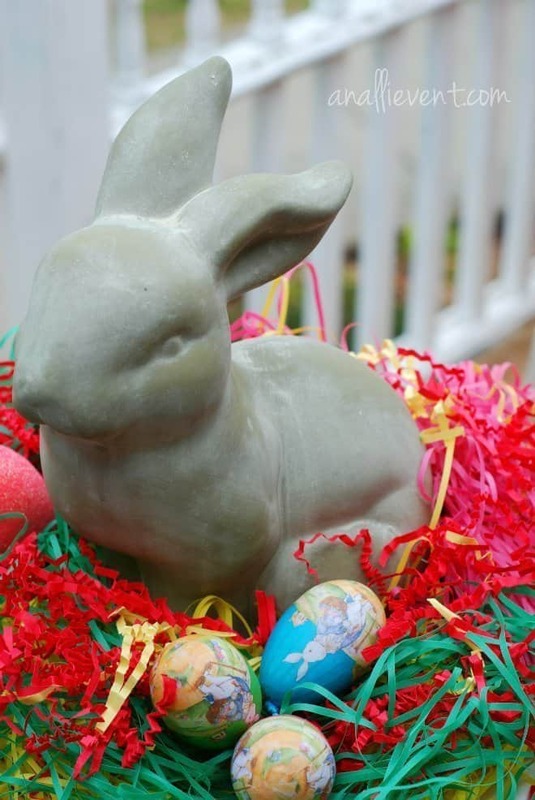 I’ve been hunting online for easy Easter centerpiece ideas and yours are the best I’ve seen. These are wonderful ideas. They would be perfect for my Easter tablescape this year. Love the jelly beans on the tree. So many great ideas for people who celebrate Easter. I have always loved the candy and these centerpieces had so many good choices. You are right, waited too long and now most of the decor stuff in stores is basically gone! I love your easter egg jelly bean tree though and I can totally do that! I also just 3D printed a big white bunny planter that is going to help me out as well! I am hosting Easter at my house this year and I want it To look nice. I need to make one of these centerpieces. First of all I love this blog. It is always so cheery and there’s always something fun to see or make here. That adorable Peeps centrepiece has simply got to happen. Love it. Great Easter ideas here and your tablescapes are really cute and fresh. I adore those ideas and one of my favorite things is different egg holders. I am wanting to start a collection of those. OK these are adorable what a fun and cute idea to have for your centre decorations come Easter! We were just talking about this yesterday! I couldn’t figure out what I was going to make. These are all great options! I like having a pretty centerpiece on my table. I try to use what I have. I am really trying not to add new stuff in my life. Wow, what a cute and brilliant idea, I really like it! My sister is hosting our Easter party and I am so excited to share this with her. This Easter centerpiece is so cute! My kid wil have fun making it! Those pastel colors really refreshes eyes, so cheerful to see. That coconut cake roll looks delicious. I love how simple these are – I can make a few this weekend! I love the burlap bunnies and the jelly bean tree, those will definitely be part of our Easter decor! These are really good ideas! I love that it’s easy to make. I am not artistic but I think I can pull a centerpiece this year! Love those center pieces! I really love Easter DIY projects, fun to see colorful eggs. I love all of these centerpieces, they are all so colorful and CUTE! I have to work this year on East Sunday…boooo!